Carlton Fine Art and Antiques is situated on the 2nd floor of Salt’s Mill in the historic village of Saltaire near Shipley in West Yorkshire. This model industrial village with its Hockney connections was designated a World Heritage Site in 2001. Carlton Fine Art and Antiques is not just a traditional antique shop, dealing in fine furniture, paintings and quality objet d'art, but is also an 'Antique Centre' with approx 40 dealers selling a wide range of quality antiques and collectables. 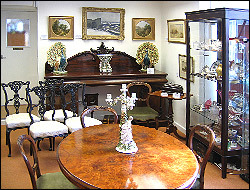 Our aim at Carlton Fine Art and Antiques is to cater for every taste and pocket. Wednesday to Sunday : – 10.00am – 5.00pm. Bank Holidays : 10.30am – 5.30pm. In 2014 Malcolm Gray retired from running the business and former antiques dealers Alan Othick and Andrew Howden took over the centre carrying on the fine tradition of Carlton Antiques selling quality antiques for every taste and pocket.